The late April announcement that India would no longer be a partner with Russia on the Sukhoi Su-57 program has raised questions about what the future is for Russian military aerospace. The newest design from the long-time fighter designer had been billed as the next-generation evolution in Russia’s aviation industrial complex and was intended to be Moscow’s response to the Lockheed Martin F-22A. However, delays in producing both a new engine, the Izdeliye 129 design being developed by a team of different Russian aero-engine firms, and the new N036 AESA radar being developed by NIIP in Zhukovskiy, had forced the program to make significant compromises. The initial versions of the aircraft are being manufactured with the same Saturn/Lyulka 117S/Al-41F-1S engine and NIIP N035 passive (PESA) Irbis radar set that are installed in the Su-35. At this time the number of Su-57s on order amounts to only 12 units, to be delivered to the VKS. The aircraft was deployed in late February for a brief set of demonstration missions with the Russian forces in Syria in what was criticized as little more than a PR move, but the specialists that AIN spoke to stated that the real capability of the aircraft cannot be demonstrated until a new engine, radar, and avionics suite are flown, tested, validated, and have entered full-scale production. There are active efforts to sell aircraft that are currently in production to export customers. The Su-35, which had previously been sold to China’s People’s Liberation Army Air Force (PLAAF), has been employed in some of its first operations. 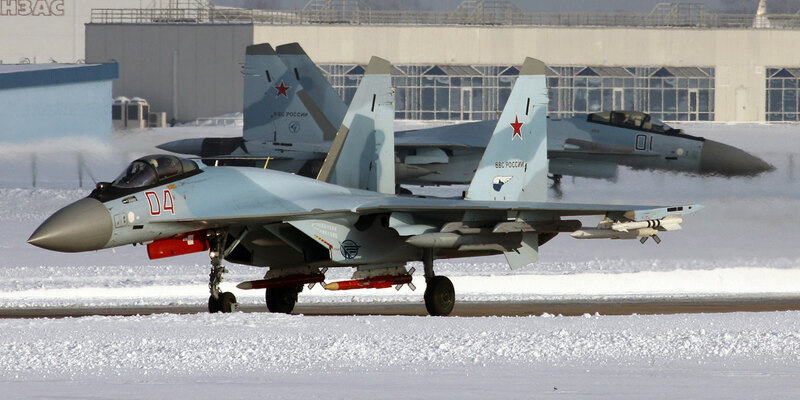 The PLAAF has been one of the Russian industry’s most important and primary cash-generating customers for more than 25 years, so the sale of the Su-35 to Beijing after many years of sales of Su-27 and Su-30 models is part of an effort to retain this customer for the immediate future. The aircraft participated in some of the recent flights that circled the Republic of China (ROC, i.e. Taiwan) as part of a series of activities designed to intimidate the island nation. The PLAAF has thus telegraphed its intentions to make the Su-35 part of its spearhead operations aimed at the ROC and other potential island targets by flying the Russian-made fighter alongside the Xi’an H-6K bomber and several other ELINT and AEW&C platforms. PLAAF Su-35s have also been seen flying into Novosibirsk/Tolmochevo airport on a refueling stop en route to Moscow recently. This has sparked speculation that the PLAAF is looking to acquire more Su-35s and is exploring options to modify the configuration of the aircraft currently in their inventory. The publicity of the sale to the PRC has been part of the campaign that Moscow employed to sell the Su-35 to Indonesia. The Indonesian Air Force had been operating a mixed fleet of Su-27s, Su-30s, F-16s and the intention has been to use the Su-35 acquisition as the beginning of a process to modernize the force. By far the most important potential sale for Russian industry at present is what is being called “version 2.0” of the Indian Medium Multi-Role Combat Aircraft (M-MRCA) tender. The original, earlier tender was supposed to establish a production line for 118 fighter aircraft to satisfy the government’s “Make in India” requirement. France’s Dassault Rafale was selected in 2012, but no production line was ever put in place in India and in the end, New Delhi simply procured 36 of the fighters off-the-shelf from the production line in Bordeaux. This has left the Indian Air Force with a 118-aircraft (or greater) deficit in addition to the 127 Su-57s that would have been procured for that program and now must be acquired elsewhere. A newer variant of the Phazotron Zhuk-MA AESA radar set with a new generation of transmit/receive (T/R) modules. The T/R modules are likely to be still based on Gallium Arsenide (GaAs) technology but will be smaller and larger in number than the previous modules. An increased-thrust variant of the existing Isotov/Klimov RD-33MK engine that pushes the thrust rating up just below 10 tonnes. Increased use of composite materials in the aircraft structure to make the airframe lighter and capable of carrying more fuel and weapons systems. On March 30, retired Lt. Gen. Anatoliy Zhikarev, commander of all long-range aviation for the VKS from 2009-2016, gave an interview on the new, modernized Tu-160M2 program to Russia’s Nezavisimoye Voyennoe Obozreniye (Independent Military Review). He said there will be major improvements in the aircraft over the previous variant, making it a “longer arm” of the VKS’s strategic bomber force. The EW is so effective, he claimed, that the Russian VKS will be confident enough to engage its bomber force in direct combat while air defense threats exist in theater. He contrasted this with the U.S., which “used tactical missiles and cruise missiles to take out air defense assets in Yugoslavia and Iraq and then [only once those air defense units were neutralized] committed their strategic bombers." The overall picture is one in which Russia’s combat aviation still has a stable of viable combat platforms and customers looking to acquire these kinds of assets. What remains to be seen is how much longer these previous-generation platforms can be “stretched” into the current day and beyond before they begin to show signs of obsolescence.